► MALAWI: Swift Air grounded by courts as Government mulls Air Malawi's future following huge losses. 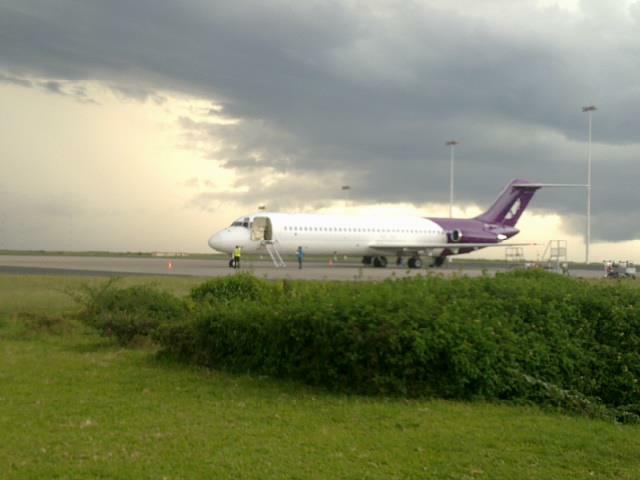 Privately owned Malawian airline Swift Air has been grounded by the Malawian courts and had its property in Lilongwe attached over outstanding rental fees and monies owed to Air Malawi, the Airport Development Limited (ADL), and various independent travel agents. Reports claim that employees at the family run company had not reported for work since May and that the airline's headquarters in Lilongwe had subsequently remained shut. Despite all this it is alleged, the airline still remained operative, albeit by proxy i.e using other carriers to ferry passengers under their trade name. "An employee who held a senior position at the company but spoke on strict condition of anonymity told Zodiak that the CEO left two months ago amid pressure from the debtors. “When all our planes were suspended two months ago due to financial challenges, the owner decided to continue selling tickets and in turn use Air Malawi to fly the customers,” said the employee adding; “The debt with Air Malawi rose to millions and she decided again to use independent travel agents to book our customers on air Malawi flights but she has failed to pay them too.”"
Prior to its grounding Swift Air operated domestically between Lilongwe, Blantyre, Mzuzu, Karonga with a single regional flight operated to Johannesburg, South Africa whilst their fleet consisted of a South African leased McDonnell Douglas DC-9 (ZS-GAU? ), an Embraer 120 (9J-RYL) and a Beechcraft 1900D. All of have either been returned to their respective owners or grounded as a result of the financial crisis at Swift Air. Founded in January 2011, the airline was seen as a viable alternative to the unreliable parastatal Air Malawi, whose own future has been called into doubt over heavy continuous annual losses, which for the year 2011, amounted to MWK1.1billion. The losses have been attributed to Air Malawi's continued use of leased aircraft for operations; a reliable if very expensive way to operate. In addition, new president Joyce Banda's financial reforms have seen the Malawian currency, the Kwacha, lose 33% of its value overall after a devaluation was effected in order to help resuscitate the then ailing Malawian economy. The loss in value of the currency means the airline has had to deal with declining hard currency revenues locally to meet its foreign debts. "With devaluation, our traffic has gone down as less and less people are able to travel," said Air Malawi's Director of Marketing Tony Chimpukuso Wednesday. "And we are still waiting for the new government to state their position on Air Malawi. The previous government was not interested in us. They just wanted us to close down," h e said. Chimpukuso said lack of equipment, costs incurred to put passengers on other airlines during breakdowns and last year's 10 percent devaluation of the kwacha contributed significantly to the losses at the airline. The Malawi Institution of Engineers (MIE) recently called on government to make a concrete stand on Air Malawi if the country's air transport sector is to be revamped. However all is not lost for the Malawian national carrier as it seems their cargo department at London Heathrow is slowly but surely regaining its market share after years of neglect. New capable staff have been hired in attempt to woe back lost business. "Air Malawi which in the recent years had been dogged with a surmount of difficulty in its operations seems to be crawling back to serious business with a full force as it has just revamped its cargo services department at its offices at Heathrow Airport, London in the United Kingdom (UK) with a an improved service delivery." So, whilst a market for sending home goods from abroad does most certainly exist, all that needs to be done is to organize an efficient and well run organization to do it.